Presenter '09 offers three different view modes for the way your learners view your presentation. There's a lot to be said for changing up the view mode. Sometimes you want learners to see a sidebar navigation panel they can click on at will... sometimes you want them to see player controls so they can pause or back up… other times, you might want them to see only your slide and nothing else. Here we'll take a look at how to customize the view mode of your presentation. Standard view features a sidebar. You can customize the sidebar to include navigation tabs like the example shown above, and you can even include a logo and a picture and bio of the narrator or presenter if you want. This view also offers player controls at the bottom edge, which you can customize too. No sidebar view is similar to Standard View except that it doesn't include a sidebar. Any player controls you've chosen for your player will still appear. Slide only view shows neither the sidebar nor the player control panel at the bottom of the player. It's just a plain and simple view of the slide. 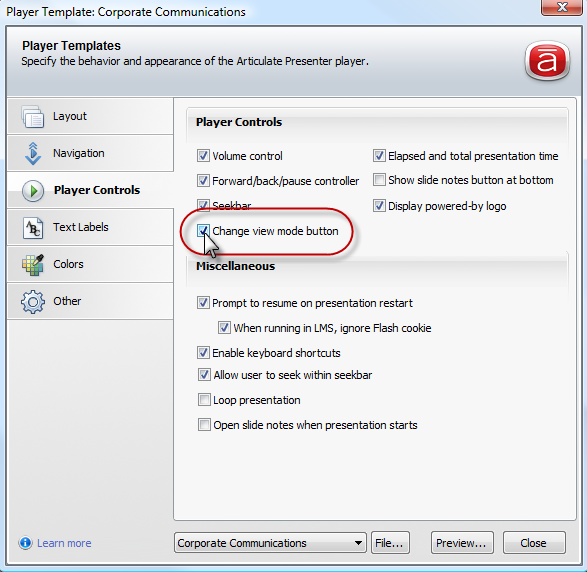 However, depending on which player controls you've enabled on your player template, a few control options might appear in the lower-right corner, such as the play/pause button, a view mode toggle button, and a button that allows learners to access slide notes. Open your presentation in PowerPoint. From the Articulate menu, select Player Templates. In the View Modes area, select the starting view you want users to see. Click Set As Starting View. Next, choose any other views that you want users to be able to switch to. A toggle button in the lower-right corner of the player allows users to switch between views. While still in the View Modes area of your player template editor, mark the box next to any of the three view modes that you want users to be able to toggle to. Or, if you prefer that users not have the option of toggling their view, you can just remove the toggle button by selecting the Player Controls tab and unmarking the box next to Change view mode button. Click Close and save your changes. Sometimes you'll want to force the view mode on specific slides. In a recent project, for example, I used No Sidebar View for most of my slides—but on the first slide in each section, I wanted the user to see the sidebar navigation panel. So on those slides, I applied Standard View. From the Articulate menu, select Slide Properties. Click in the Change View column for any slide. Choose a view mode from the dropdown. If you leave this field blank, the slide will display in the same view mode of the slide before it. When you’re finished making changes to your player template, republish your course to incorporate the changes into your published output.